I'd like to introduce you to my first posting of a real interview with an artisan named Jenny Mattheson. She's a very sweet person & always wonderful to be around with. I’ve been illustrating children’s books for 10 years (since 2000). How did you get your start and how did you prepare yourself to start a business? I got my BFA in Illustration from The Art Institute of Boston. 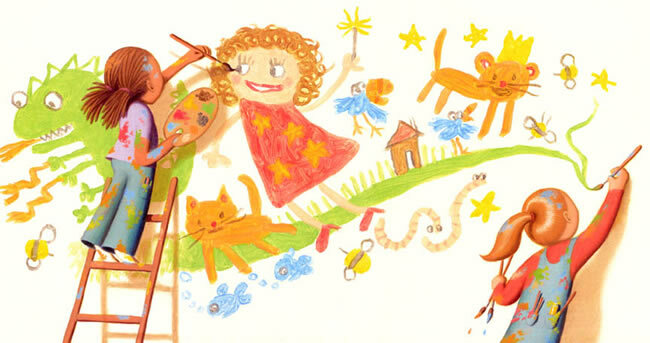 After I got out of school, I knew I wanted to be a Children’s Book Illustrator. I did a lot of networking, and sent out samples of my artwork to all the major publishers. After about a year of doing this, an editor from Little, Brown & Co showed interest in my work. She hired me to illustrate my first book, “The Mouse, the Cat and Grandmother’s Hat.” Things have continued from there, and I’ve done about 8 kid’s books. I worked part-time jobs and lived at home with my parents while I was getting started. I used my earnings to buy supplies and to make promotional packets to send to publishers. When you first started, what types of products were you selling? If you are still selling the same products, would you like to try selling different type of products? My products are my illustrations, and they’ve definitely changed over the years. I used to work in oils and take a very long time to create artwork. But I started working more quickly and eventually switched to acrylic paint which dries faster. I’ve just started working digitally in Adobe Photoshop, which is even quicker. My goal over these years has been to work more efficiently, without sacrificing quality. I got a degree in Illustration at The Art Institute of Boston. Where do you normally get your inspirations? I get most of my inspiration from my memories of my childhood. I grew up in Pennsylvania, and was the oldest of 3 kids. I don’t think I do it on purpose, but so much of my work ends up being a reflection of those times. Do you think you've "made it?" Does it support you financially? When I was in art school, my teacher told me that you do children’s book illustration because you love it, not because it makes money. At the time, I thought she was just being pessimistic. But she’s absolutely right. This business is financially unpredictable; you don’t know when or if you’ll get projects. I would advise anyone interested in this field to do work on the side. If not, what is your day job? Since I’ve been illustrating, my side jobs have been in administrative work. That’s actually incredibly handy, because you gain skills that are useful to promoting yourself and keeping organized on the business end. What's the best part of having your own business and is there an accomplishment you’re most proud of? I think the best part about having my own business is that, for the most part, I get to work at home. I’m a real homebody, so that’s a perfect fit for me. The accomplishment I’m most proud of is the number of books I’ve illustrated (10, I think). I can’t believe I’ve been in business long enough to do all that. And I’m proud of all the hard work and focus it took to achieve it. Absolutely do your research - especially if you’re investing money into the business. Make sure you know what the risk is, and make a backup plan in the event that things don’t work out. It’s tough out there, so you need to be realistic about the odds of your success. For illustrators, I’d advise to have a secondary source of income. Do you participate in craft fairs or trade shows? If yes, how was your first experience? Any tips for beginners? No, the closest I got was joining the Society of Children’s Book Writers and Illustrators, but that was about 10 years ago when I was just starting out. How and where do you advertise your business? My advertising consists of my website and my blog. And every few months I e-mail new artwork to my publishing contacts. Right now I’m focusing on smaller illustration jobs. Those are my favorite, since they don’t take half a year to finish, like children’s books do. I’m also learning the Adobe Creative Suite programs and sharpening my graphic design and digital illustration skills. 0 Response to "Featured Artisan: Jenny Mattheson (an Illustrator from USA)"